2007 saw the return of Linkin Park after an almost two year hiatus during the writing of their Minutes To Midnight album. To start the year, the band held extensive rehearsals at Third Encore and contributed some of these songs to companies like Best Buy, AOL, Wal-Mart and more. Some were used for promoting the album via putting the songs online and some were used as bonus tracks for buying the album from a certain distributor. The first 2007 shows were warmup shows at small venues in Berlin and London, which included a big surprise for fans - "One Step Closer" opened the band's setlist for the first time ever. "No More Sorrow", "Given Up", and "What I've Done" received their live debuts at these shows as well and a slower version of "Pushing Me Away" (Piano Version) from 2006 even stuck around. After these warmup shows and television appearances, including their first appearance on Saturday Night Live in the spring, Linkin Park recorded a show at Webster Hall in New York City to be shown in theaters nationwide in the US. This Webster Hall show was the live debut for "Bleed It Out" and it was one of two songs (the other being "What I've Done") that was performed on Saturday Night Live. Shortly thereafter, the band kicked off a European Tour, headlining at Pinkpop, Rock am Ring and Download Festival among others. In between, they made their first ever Russian live appearances in St. Petersburg and Moscow and even managed to sneak in two shows opening for Pearl Jam amongst other headlining dates. In Europe, "Leave Out All The Rest" and "The Little Things Give You Away" were performed for the first time. Phoenix's side of the stage featured a micstand as he added backing vocals for the first time, something that continues to present day. It was on this tour that "Bleed It Out" started to be extended, which later became a staple of the setlists. Immediately following the tour, the band headlined the Tokyo stage for Japan's portion of the Live Earth concerts. 2007 also saw the return of Projekt Revolution after a 3 year absence. The summer tour's lineup included My Chemical Romance, Taking Back Sunday, HIM, Placebo and Julien-K on the Main stage and Mindless Self Indulgence, Saosin, The Bled, Styles of Beyond and Madina Lake on the Revolution stage. In a teaser video on the band's site, it was confirmed that three setlists were to be used on this tour. By the end of the tour, the band actually utilized four distinct setlists incorporating tracks from all three of their albums. This was the first time that the band would rotate setlists on tour. Live debuts for "Wake", "Shadow Of The Day" and "In Pieces" came at this time along with "QWERTY" making an appearance again for part of the tour and "Cure For The Itch" being played for the first time since 2001! Mike began rapping different verses over the intro of "Points Of Authority" while Rob started performing drum solos during the bridge of "Bleed It Out". On August 22, MySpace.com steamed live video from the main stage at the DTE Energy Music Centre in Clarkston, MI. 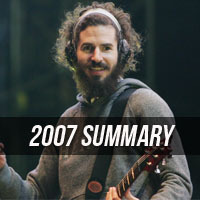 This tour was the first (of hopefully many) where the band made copies of their performance available for sale though live.linkinpark.com. A blank CD, CD cover and download code could be purchased at the merchandise booths of each show and the performance could be downloaded within 3 to 5 days from the band's site. Later, this practice expanded online where fans could begin to preorder shows themselves. Linkin Park set into an Australian & New Zealand tour in October and followed it up with a tour in Asia, including stops in Thailand, Singapore, Taiwan, China, Hong Kong, Japan and South Korea. The year was not without its troubles for the band. Their appearance at the Heineken Jammin' Festival in Italy was canceled due to a storm which caused damage to the general area; the live recording from the Projekt Revolution show in Wantagh, NY could not be sold due to difficulties with the venue's policies. Last, but not least, Chester broke his wrist during the second night of the Melbourne, Australia shows. Being the performer he is, he didn't miss a beat and left the stage only shortly (four or five songs after it happened!) to be checked out before finishing the show. In November of 2007, Linkin Park began announcing 2008 concert dates in Europe again, this time planning an arena tour in January. They finished the year off on a high note by playing a very unique, highlight-filled performance at their hometown KROQ Almost Acoustic Christmas show. 2007.06.15 Venezia - Reason: Huge storm. This page was last edited on 28 March 2019, at 15:50.